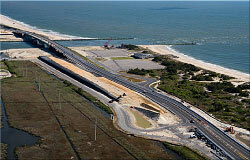 This $35,000,000.00 project consists of relocating the existing State Route 1 roadway to facilitate construction of the new Indian River Inlet Bridge. The project also involves the construction of the new bridge approaches and construction of 3 mitigation sites to replace wetlands that will be eliminated by the new bridge construction. Part of a twenty million dollar renovation and upgrade to the existing inlet facilities, this project included all new sewer, water, paving and landscaping on the land side of the marina and new piling, floating docks, steel sheetpile bulkheads and boat ramp on the waterside of the marina. 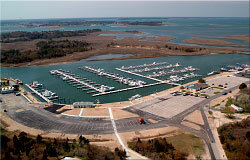 This project was constructed during the winter months to alleviate any inconvenience to the marina’s customers. 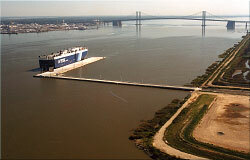 One of only two facilities like this in the United States, this project allowed for the much needed expansion of the Port of Wilmington out and into the Delaware River. Expansion into the river prior to the construction of the Autoberth had been stopped due to environmental concerns caused by dredging the river. By building a trestle structure and locating the berth 1000 feet offshore no dredging was required to build this facility. 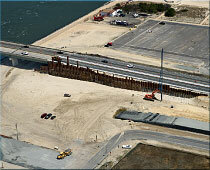 This signature structure helps to market the Port of Wilmington as a leader in the import and export of cars worldwide. This state of the art boat storage facility was constructed under a Design Build Contract with the Delaware Department of Natural Resources. 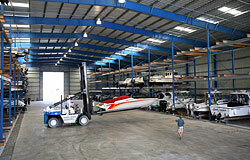 Inside the facility is a fire suppression system that includes sprinklers over every boat stored in the facility. This project won the 2006 Delaware Contractors Association Construction Excellence Award for Smart Growth. Constructed in 1995 and 1996 this project faced community opposition during the planning phase. In an effort to curb the opposition the plant was designed to blend into the surrounding farmland community by housing the process equipment and control building structures in a facility that architecturally resembled a dairy farm. 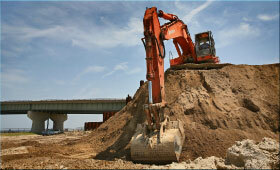 This project won the American Public Works Association – Public Works Project Of The Year. 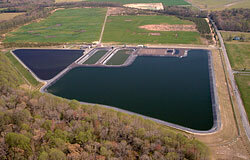 Having constructed the original spray irrigation plant in 1993 Kuhn Construction was contracted by the Town of Georgetown to expand the facility in 2003. 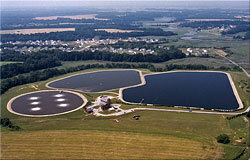 Kuhn added additional processing equipment, constructed a 75 million gallon bentonite lined storage lagoon and a built a new equalization basin structure.